So you’ve bought yourself a top line gaming rig with the best graphics card that money can buy? 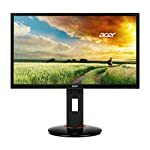 But that’s no use to you unless you opt for pairing it with a top of the range gaming monitor. You’re on the right site to sort that problem. Here we look at the BenQ XL2420G, a 24″ gamer orientated beast capable of showing 144 frames per second, with a fast as you get 1ms response time and Nvidia G-Sync compatibility built in. The BenQ XL2420G is part of their excellent gaming range and as such this monitor is styled with this theme. Let’s be frank, it won’t be a perfect match for a professional looking home office but it still looks sleek enough. If your game rig has more of a battle station feel then this will fit right in! Round the back you’ll find a DisplayPort socket, this is to be expected on a G-Sync monitor but in more interesting news, you’ll also find an HDMI and DVI socket so you can, if you wish, have multiple devices hooked up. You also get USB 2.0 ports and a headphone socket thrown in. The T-shaped stand is solid and features smooth adjustments so you can effortlessly move the monitor up and down for example. The package also includes the S-switch, a remote control that allows you to “customise and save your display settings for gaming, work or entertainment purposes”. I’ve no experience of using this but it does sound useful, saves messing around with annoying on screen menus. The XL2420G features G-Sync adaptive synchronisation technology which is fast becoming a must have feature for gamers, it really does make a difference to your game playing experience. When enabled you’ll get a much smoother image, and whilst low frame rates are never going to look as good as a steady high rate it can help to reduce stutter and screen tearing. G-Sync is the Nvidia solution so you’ll need a compatible card, something like a GTX 1070 will pair up well with this monitor. 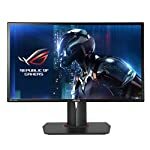 Professional reviewers have highlighted the low latency of this monitor meaning that it will feel responsive in games, and also the great colour accuracy. This is a TN based screen though which means that viewing angles won’t be great. The colour accuracy will deteriorate when you look at the screen side on, or from above. Gaming on this monitor is fantastic, with crisp, stutter-free game play with no screen tearing or other motion artefacts. We give the BenQ XL2420G a 4 out of 5 rating. Want to know what existing owners of the monitor think? You can read real user reviews here. 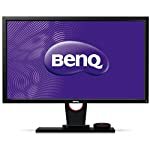 Should I buy the BenQ XL2420G? There's not much to dislike on the BenQ XL2420G, good colour reproduction, great gaming performance, plenty of configuration options and connectivity that beats many rivals. If you are having some doubts about this purchase then why not read some real owner reviews and see what other buyers think. Welcome to the BenQ XL2420G FAQ. This section attempts to answer common questions you may have, please get in touch if you have any more queries or if you think our answers need updating. Yes. Many G-Sync monitors only offer DisplayPort inputs but the BenQ also has HDMI and DVI sockets. Would this be a good choice for graphic design? Not really. It is an out and out game orientated screen. You would be better off looking for something with an IPS based panel, you’ll get a more faithful reproduction on screen.